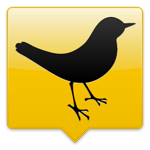 TwitJobSearch, a Twitter-based job search engine, has teamed up with TweetDeck to offer a desktop client dubbed JobDeck, as reported by Clickz earlier this morning. The application indexes tweets related to recruitment from across the Twittersphere, in real-time, based on TwitJobSearch’s algorithm. 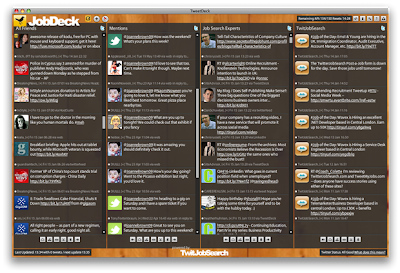 Basically, it’s just a custom branded TweetDeck client that comes with two additional default columns: ‘Job Search Experts’ and ‘TwitJobSearch’, although it can also prove helpful to add a LinkedIn column carrying the latest updates from the professional social network and perhaps even your Facebook news feed. Recruiters can follow a few simple steps to ensure their tweets are indexed by the TwitJobSearch service, helping them connect with potential candidates through social media more effectively, and for free. The TwitJobSearch site itself offers advertisers the ability to purchase premium, or “Tweetured” job listings, sold on a CPC basis. Current advertisers include brands such as Adidas, KFC, and Lloyds Banking Group, according to Clickz. The JobDeck app itself will not feature any premium ad opportunities at this point.